Formula One found itself on the front page of just about every Australian newspaper after the Australian Grand Prix, but for all the wrong reasons. "Death Crash Safety Row" was just one of the more muted headlines, and large photographs - in full colour naturally - of Jacques Villeneuve's car flying though the air, covered most of the available space under the banner headlines. This is not what modern day F1 is supposed to be about. Grand Prix organisers like to talk about how hosting a round of the FIA world championship puts their city or country on the map, about the positive impact it makes on the local economy. It is supposed to be a good day out for everyone, to watch the cars and stars perform. It's not supposed to be about people getting killed. Papers ran lead stories about how the 51-year-old volunteer marshal, Graham Beveridge, from the small town of Winfield in Qeensland, travelled all the way to Melbourne to fulfill his passion for cars and motorsport, only to get fatally injured by a flying wheel. These stories are bad news for everyone, and most of all, of course, for the victim, his friends and family. It doesn't help them at all that in the words of Australian Grand Prix chairman Ron Walker, this was a "one in a billion accident that could not have been avoided." But could it? It certainly was plain bad luck, that the errant wheel passed through an opening in the fencing that was specifically left there for safety workers and marshals to gain access to the track to assist the drivers in the case of just such an accident. And, as anyone who has ever climbed through one of these opening can attest, the gap is not very large, and so for the wheel's exact trajectory to pass through this gap was indeed a 'one in a billion' chance. But, in the immediate aftermath of the accident and the announcement of the marshal's death, many of Formula One's senior figures were calling for change, or at least a review of the way current circuit's debris fencings are designed, and the positioning of marshals and safety workers. The fact that this is the second fatality in just five races - fire marshal Paolo Gislimberti having been killed last September at Monza - gave added impetus for the calls for change. Once might just be bad luck, twice is getting a lot harder to explain away. Long-time safety campaigner and three-time world champion Jackie Stewart was one of the first to express and opinion. "The type of explosive accident that we saw today, you can't get them much bigger than that," Stewart told Atlas F1. "But even Luciano's (Burti) accident on Saturday was a very big accident, but he had an impact right next to the wall and the debris fence, so therefore the debris was going to come back on to the race track, rather than potentially the other way, out of the track. I think our biggest responsibility is to retain the accident within the racetrack, that's our biggest challenge I think." Stewart's mention of Burti's crash during Saturday's qualifying session, reminded everyone that the race weekend had seen three or four potentially nasty moments. Burti was able to shrug off the effects of his crash, as most drivers do. "Before the car had even come to a stop I had my hand on the seatbelts, ready to jump out and run back for the spare car," the Brazilian said afterwards. Fortunately, there were no outside consequences and the world quickly moved on looking for the next piece of news. On the day before, the Media room had held its collective breath as Michael Schumacher's Ferrari suddenly rolled over violently several times, as his car slid sideways onto the gravel trap. For some seconds the World Champion's car was obscured by swirling dust, but once again the 'survival cell' that is the modern F1 car did its job, and there were no tears afterwards, although it once again opened the debate about the design and effectiveness of gravel traps. The accident involving the BMW-Williams of Ralf Schumacher and the BAR-Honda of Jacques Villeneuve was obviously in another league entirely. The view from Villeneuve's onboard camera not only showed the full force of the impact, but it also kept running long enough to show blurred visions of the sky and parts of trees flashing by as the car was launched high into the air, before the camera's transmissions ceased as the car destroyed itself against the retaining wall. No wonder a very shaken Jacques Villeneuve spent quite a while composing himself in the BAR garage afterwards and refused to immediately talk to the press. Indeed, he later decided to go to a local hospital for a check-up on a slightly injured back and neck. A clearly upset Craig Pollock, Villeneuve's team boss, spoke for the whole Formula One community when he expressed his shock and sorrow for the death of the marshal. "Anything like this always overshadows the results," Pollock said after the race. "Tthis is such an enormous thing that has happened, you can only think for the family. You can't do anything for the poor marshal, but you can for the family, I am certain that everyone will ensure that they are well looked after." On just what caused the collision between the two cars no one was prepared to go on record or express a firm opinion until all the facts were in. Pollock ruled out any mechanical failure on his team's car and expressed the opinion that it was just a racing incident between the two drivers, a view supported by the three race stewards. BMW-Williams technical director Patrick Head, whilst stating that he hadn't yet looked at the data, offered the opinion that his driver Ralf Schumacher had been entirely blameless. Head said: "Ralf said that he braked in the normal place, and I think that the data will show that as well." Both drivers were interviewed by the Stewards, and by officers of the Victoria Police Major Accident Investigation Unit, who are preparing a file to be used at the inquest. The remains of Villeneuve's car were also impounded. 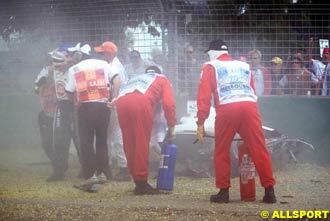 But, the question remains just why did Villeneuve hit the rear of Ralf Schumacher's car with such force? In any normal rear-end road accident, the blame usually lies with the driver coming from behind, and in most normal outbraking manoeuvres, the overtaking driver's extra speed is minimal, so any contact is not enough to launch the cars into the air with such violence. Certainly, Villeneuve had been closing in on Ralf over the preceding lap. He crossed the start-finish line just 0.313 seconds behind the BMW-Williams at the end of lap four, after managing a lap some 0.126 seconds quicker on the previous tour. As the two cars raced up to turn three, the nose of the BAR-Honda was close enough for the BMW-Williams driver to defend the inside line into the braking zone. Until all the telemetry data is released, all speculation remains just that, speculation. But, if an investigation rules out any sort of mechanical failure on either car, then it would appear that maybe Jacques Villeneuve just missed his braking point by a fraction in the heat of the battle. Even if that turns out to be the case, it doesn't change the fact that the collision was a mere racing accident. So just where does Formula One go from here? It would appear that the debris fencing did do much of the job it was designed to do with the obvious exception of the gap left for the officials to gain entry to the track. Perhaps these could be redesigned so that objects heading in the direction that the cars travel could not penetrate, and certainly thought needs to be given to construction of 'strong points' so that marshals, who need to be close to the track, are adequately protected. Whatever you do, you are not going to stop wheels coming off open wheel racing cars involved in high speed crashes - the energy involved is just too great. As Patrick Head pointed out,it doesn't take much of an impact to get a force of five tons on each of the two tethers, so it would seem that even more tethers is not going to be an easy solution. But, the FIA surely needs to review this whole area as vigorously as they have pursued the issue of driver safety. After all, without all the volunteer marshals and helpers, the multi million game that is modern Grand Prix racing wouldn't even be able to turn a wheel. Within minutes of the end of the race, the Formula One circus was packing up and heading off for the next event in the seventeen round championship trail. For those flying out through Melbourne airport, one of their last sights of Australia would have been an advertising hoarding promoting the race. The banner proclaimed: "This Is Living - Formula One". Unfortunately it was not true for everyone.